The European Goldfinch or Goldfinch (Carduelis carduelis), is a small passerine bird in the finch family. 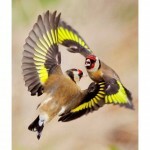 The average Goldfinch is 12–13 cm long with a wingspan of 21–25 cm and a weight of 14 to 19 grams. The sexes are broadly similar, with a red face, black and white head, warm brown upperparts, white underparts with buff flanks and breast patches, and black and yellow wings. On closer inspection male Goldfinches can often be distinguished by a larger, darker red mask that extends just behind the eye. In females, the red face does not reach the eye. The ivory-coloured bill is long and pointed, and the tail is forked. Goldfinches in breeding condition have a white bill, with a greyish or blackish mark at the tip for the rest of the year. Juveniles have a plain head and a greyer back but are unmistakable due to the yellow wing stripe. Birds in central Asia (caniceps group) have a plain grey head behind the red face, lacking the black and white head pattern of European and western Asian birds. The goldfinch is native to Europe, North Africa, and western and central Asia. It is found in open, partially wooded lowlands and is a resident in the milder west of its range, but migrates from colder regions. It will also make local movements, even in the west, to escape bad weather. It has been introduced to many areas of the world. It was introduced at numerous places in south-eastern Australia in the 19th century, and their populations quickly increased and their range expanded greatly. They now occur from Brisbane to the Eyre Peninsula. The Japanese White-eye (Zosterops japonicus), also known as the mejiro (メジロ, 目白), is a small passerine bird in the white-eye family. The specific epithet is occasionally written japonica, but this is incorrect due to the gender of the genus. Its native range includes much of east Asia, including Japan, China, Vietnam, Taiwan, and the Philippines. It has been intentionally introduced to other parts of the world as a pet and as pest control, with mixed results. As one of the native species of the Japanese islands, it has been depicted in Japanese art on numerous occasions, and historically was kept as a cage bird. The Japanese White-eye is olive green on its back, from anterior to posterior, and is pale green on its underside. Its feet, legs, and bill range from black to brown. It has a green forehead and a yellow throat. The White-eye has rounded wings and a long, slender bill – both of which indicate this bird to be very acrobatic. Its wings are dark brown, but outlined in green. Like other white-eyes, this species exhibits the distinctive white eyering that gives it its name (mejiro also meaning “white eye” in Japanese). Adults range from 4 to 4.5 inches in length, and weigh between 9.75 and 12.75 grams. The Grey-chinned Minivet (Pericrocotus solaris) is a species of bird in the Campephagidae family. It is found in Bangladesh, Bhutan, Cambodia, China, India, Indonesia, Laos, Malaysia, Myanmar, Nepal, Taiwan, Thailand, and Vietnam. Its natural habitat is subtropical or tropical moist lowland forests. The Collared Trogon, Trogon collaris, is a near passerine bird in the trogon family, Trogonidae. It is found in the warmer parts of the Neotropics, and includes numerous subspecies, including T. c. exoptatus from northern Colombia, northern Venezuela and Trinidad and Tobago. It is a resident of tropical forests, where it nests in a hole in a termite nest or tree, with a typical clutch of two white eggs. Collared Trogons feed on insects and fruit, and their broad bills and weak legs reflect their diet and arboreal habits. Although their flight is fast, they are reluctant to fly any distance. They typically perch upright and motionless. Trogons have distinctive male and female plumages, with soft, often colourful, feathers. This species is about 25 cm long. The back, head and breast of the male are green, and a white line separates the breast from the red underparts. The undertail is white with black barring, and the wings are black, vermiculated with white. The female has a brown back, head and breast, a relatively uniform undertail (not clearly barred), and underparts that are slightly paler than in the male. The call is a plaintive caow, caow, caow. The Long-tailed Sylph (Aglaiocercus kingi) is a species of hummingbird in the Trochilidae family. It is found in Bolivia, Colombia, Ecuador, Peru, and Venezuela. Its natural habitat is subtropical or tropical moist montane forest. Courtship strategy. The male long-tailed sylph carries characteristic elongated tail feathers. These feathers are so ridiculously long that they hinder his flight: it is difficult for him to carry such finery every day when he relies on his flying skills to survive. Female sylphs, whose tails are of a more modest size, pick out and mate with the males with the longest tail feathers. They therefore ensure that they are mating with a male who is so fit and healthy that he can live well enough to come into breeding condition even when carrying a heavy load. The Woodchat Shrike (Lanius senator) is a member of the shrike family Laniidae. The Woodchat breeds in southern Europe, the Middle East and northwest Africa, and winters in tropical Africa. It breeds in open cultivated country, preferably with orchard trees and some bare or sandy ground. The male is a striking bird with black and white plumage and a chestnut crown. The race L. s. badius of the western Mediterranean lacks the large white wing patches. In the female and young birds the upperparts are brown and vermiculated. Underparts are buff and also vermiculated. This migratory medium-sized passerine eats large insects, small birds and amphibians. Like other shrikes it hunts from prominent perches, and impales corpses on thorns or barbed wire as a “larder”. This species often overshoots its breeding range on spring migration, and is a rare, but annual, visitor to Great Britain. The Balearic race badius has occurred in Britain around four times as a vagrant, and has also been recorded once in Ireland. The Western Meadowlark (Sturnella neglecta) is a medium-sized icterid bird, about 8.5 in (22 cm) long. It nests on the ground in open country in western and central North America grassland. It feeds mostly on insects, but also seeds and berries. It has distinctive calls described as watery or flute-like, which distinguish it from the closely related Eastern Meadowlark. Adults have yellow underparts, with a black “V” on the breast, and white flanks which are streaked with black. Their upper parts are mostly brown, but also have black streaks. These birds have long pointed bills and their heads are striped with light brown and black. Their breeding habitats are grasslands, prairies, pastures, and abandoned fields, all of which may be found from across western and central North America to northern Mexico. Where their range overlaps with the eastern species, these birds prefer thinner, drier vegetation; the two types of birds generally do not interbreed but do defend territory against one another. Their nests are situated on the ground, and are covered with a roof woven from grass. There may be more than one nesting female in a male’s territory. Their nests are sometimes destroyed by mowing operations with eggs and young in them. Western Meadowlarks are permanent residents throughout much of their range. Northern birds may migrate to the southern parts of their range; some birds also move east in the southern United States. The Red-necked Falcon or Red-headed Merlin (Falco chicquera) is a bird of prey in the falcon family. This bird is a widespread resident in India and adjacent regions as well as sub-Saharan Africa. It is sometimes called Turumti locally. The Red-necked Falcon is a medium-sized, long-winged species with a bright rufous crown and nape. It is on average 30–36 cm in length with a wingspan of 85 cm. The sexes are similar except in size: males are smaller than females as is usual in falcons. Young birds are buff below with less extensive barring and duller upper plumage. The adult of the African subspecies Falco chicquera ruficollis has a white face apart from black moustachial stripes. The upperparts are pale grey, with black primary wing feathers and tail tip. The underparts are white with dark barring on the underwings, lower breast, belly and undertail. There is a buff foreneck band. The legs and eyering are yellow. The voice of this species is a shrill kek-kek-kek. The Steller’s Sea Eagle (Haliaeetus pelagicus)  is a large bird of prey in the family Accipitridae. It is an eagle that lives in coastal northeastern Asia and mainly preys on fish and water birds. On average, it is the heaviest eagle in the world, at about 5 to 9 kilograms (11 to 20 lb; 0.79 to 1.42 st), but may lag behind the Harpy Eagle (Harpia harpyja) and Philippine Eagle (Pithecophaga jefferyi) in some standard measurements. This bird is named after the German naturalist Georg Wilhelm Steller. Steller’s Sea-eagle is the biggest bird in the genus Haliaeetus and is one of the largest raptors overall. Females typically weigh from 6.8 to 9 kilograms (15 to 20 lb; 1.07 to 1.42 st), with an average of 7.6 kilograms (17 lb; 1.20 st) while males are rather lighter with a weight range from 4.9 to 6 kilograms (11 to 13 lb; 0.77 to 0.94 st). At its average weight, the Steller’s outweighs both the average Harpy and the average Philippine Eagles by over 0.5 kilograms (1.1 lb; 0.079 st). The Steller’s Sea Eagle’s can range in total length from 85 to 105 cm (33 to 41 in). The wingspan is from 1.95 to 2.5 m (6.4 to 8.2 ft) and the wing chord measurement is 57–68 cm (22–27 in). The Steller’s sea eagle has the second largest median wingspan of any eagle. Both the wing chord and wingspan, at an average of 2.13 m (7.0 ft), are similar or slightly smaller than to those of the Steller’s close relative, the White-tailed Eagle (Haliaeetus albicilla), which is nonetheless rather smaller in both weight and total length. As in mostHaliaeetus eagles, the tarsus and the tail in this species are relatively short compared to other very large eagles at 9.5–10 cm (3.7–3.9 in) and 32–39 cm (13–15 in) in length, respectively. The bill is very large. In fact, the skull (at around 14.6 cm (5.7 in)) and the culmen (at around 7 cm (2.8 in)) of the Steller’s Sea Eagle are the largest of any eagle and are comparable in size to those of the largest accipitrids, the Old World vultures. The White-fronted Bee-eater (Merops bullockoides) is a species of bee-eater widely distributed in sub-equatorial Africa. They have a distinctive white forehead, a square tail and a bright red patch on their throat. They nest in small colonies, digging holes in cliffs or earthen banks but can usually be seen in low trees waiting for passing insects from which they hunt either by making quick hawking flights or gliding down before hovering briefly to catch insects.